We’re passionate about stories – we’ve always known that we wanted narrative and story-telling to be a part of the Eternal experience, and that we wanted to continue our exploration of new ways to tell stories in card games. With that in mind, we’ve got a couple of changes coming when Season 16 comes to a close this weekend: Chapters and Heroes. Starting next week, we’re transitioning from “Seasons” to “Chapters” in how we talk about month-to-month Leaderboards, Events, and Leagues. Each new Chapter in Eternal will take a step forward (some larger, as you’ve become used to with campaigns like Dead Reckoning, and some fairly small) in the overall story of the game, and help tie together sets and campaigns, as well as our monthly activities like promo cards, Events and more. Chapters will provide more shape and structure to the various things happening in the game over the course of a month, and will give us more opportunities to talk about the lore of Eternal. Each time a new Chapter begins, you should expect to see another glimpse into what’s going on in the game world. So April – which previously would have been labeled “Season 17” – is now Chapter 17: Enemies at the Gates. 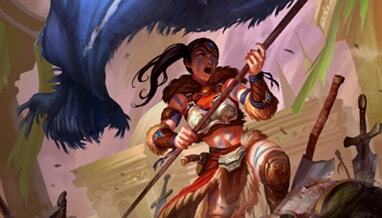 Check it out to learn more about the beginning of the Siege of Argenport! The battle for the Eternal Throne takes place in a rich fantasy world filled with bold gunslingers and crafty wizards, massive sentinels and wild yeti. It’s all a lot of good weird fun, but the heart of our story is the larger-than-life characters who call Myria home. These are our Heroes: the specific characters who separate themselves from the pack, and change their world in the process. In our second change coming next week, a whole bunch of characters in Eternal will get a searchable “Hero” tag to help identify their special status in the world. At present, this is an under-the-hood change with no mechanical effects, but we’re working on some fun related things for down the road. Each month we’ll be introducing another Hero to Eternal in the form of a promo card. These Heroes will provide opportunities to explore a bit more of the ongoing story of Eternal, and provide some new perspectives on what’s going on in the world. Like Dizo and others before him, these will be earned during a special quest, where your first PVP win each day rewards you with a copy. We’re also looking at some other fun ways to deliver Hero promos, so keep an eye out there for more. Each monthly Chapter in Eternal now includes a sealed-deck League! Leagues play out over the course of a Chapter. You’ll open eight packs when you start a League, and earn one new pack each week, improving your deck along the way. Everyone who participates in a League will earn a sweet new cardback when it ends! We’ve got a lot more fun stuff on the way for Eternal that we’ll be talking about in the coming months…but for now we’ve got to get back to building it.